There has not been a lot of visible progress at the Deepwater site today. As might be anticipated when BP are trying to extract the three segments of pipe that Admiral Allen commented had been found above the Blowout Preventer (BOP) and in the rams. Given the need for the procedures to be conceived, written up, approved and then followed, it may be a little time before the pipe segments get removed. This is particularly true if the ram closures that I noted in the last post have yet to be fixed. The Admiral does not seem concerned with the possibility that if they get hold of the long length of drill pipe that is held in the grip of the rams in the BOP that it will shear when the holding rams are released. This suggests perhaps that they may know (from the scans made of the BOP back near the beginning of this episode) what the pipe looks like, and do not expect that it has been materially cut by the shear blades. (Since it is that cut that would be needed as a starting crack, to help initiate separation of the pipe at the cut, and since it has not failed yet, they may assume that it has sufficient integrity to hold up during the removal process). I don't believe so. 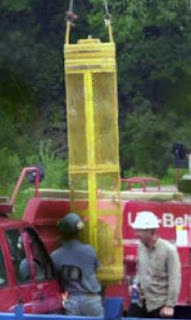 (It'll fall down) into the well to the extent that it could, and as long as it wasn't protruding above the wellhead, would actually not become an obstacle to removing the blowout preventer. But I think, for forensic purposes, they would like to have that pipe so they can examine it. He does not, thus, anticipate that it would do much damage to the bottom of the well, even if it fell and hit the top of the cement plug, given its length and that it is surrounded by the production casing and, over an unknown length, by an external cement liner filling the annulus to the surrounding rock. 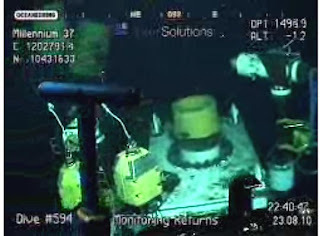 At present the down-hole camera is not working, the stack seems to have been left open with the BOA Sub C Rov1 monitoring it to see if there are any returns, and the drill rod is swinging freely in the water. 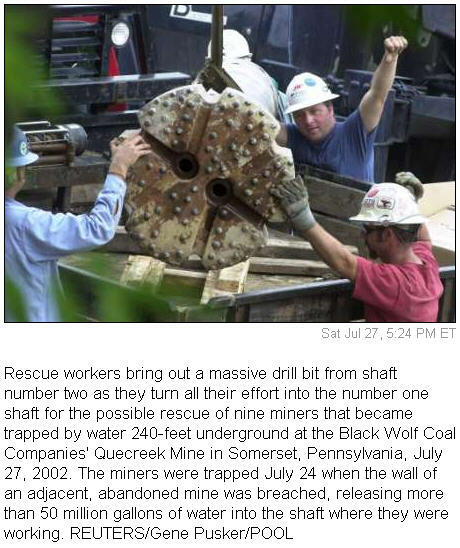 The picture is from the Quecreek rescue operation. 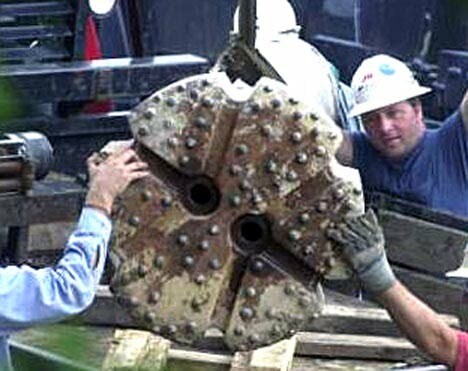 However that was a relatively shallow coal mine, with softer rock, and so they are apparently going to use a bit with polycrystalline diamond compact teeth which will allow them to cut through the harder rock. The penetration rate is expected to be about 65 ft a day, though some of the rock from the video shown of the existing borehole passage, seemed to be broken, and that will make drilling that much more difficult. The refuge is on the side of a spiral tunnel or slope, that rotated around the ore body as it traversed lower, and in the higher regions of the mine, this was closed by a rock collapse. It appears to have been the only access to the deeper parts of the mine. 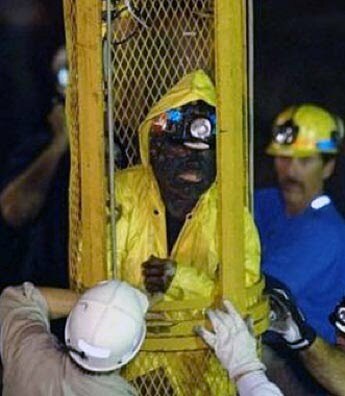 In many countries there has to be a second way out, brought about after the Hartley Mining Disaster in the UK in 1862, when 199 miners died because the only shaft into the mine was blocked. (The first school I went to was at New Hartley, when my Dad was manager there). The rescue cage at Quecreek. Small as it is it held each of the miners and brought them to safety. 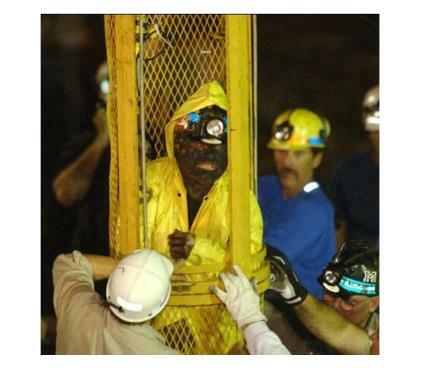 Rescued miner being brought out of the Quecreek Mine. Let us hope that the miners in Chile are similarly all safely recovered. Meanwhile, looking at other natural hazards, there have been about half-a-dozen 3.0 or greater earthquakes in the Loki area of Iceland in the last few days, and just when it appears that we will dodge the Hurricane bullet of Danielle, the next one seems to be forming behind it.